Alexander Peplow is a first-year DPhil student in History at Merton College, Oxford, and a member of the Teaching the Codex committee. Here, he writes about one of the Bodleian’s Martin Luther autographs, which he encountered as a Master’s student in Medieval Studies, and reflects on some of the techniques he used to analyse it. Bodleian Libraries, MS Add. A. 92. Photograph: Alexander Peplow, courtesy Bodleian Libraries. Bodleian Libraries, MS Add. A. 92, f.1r. Photograph: Alexander Peplow, courtesy Bodleian Libraries. To come across something in the handwriting of Martin Luther, then, is rather exciting. An excitement only a little dimmed by opening to actually see what the handwriting of Martin Luther looks like – which is not always the clearest. 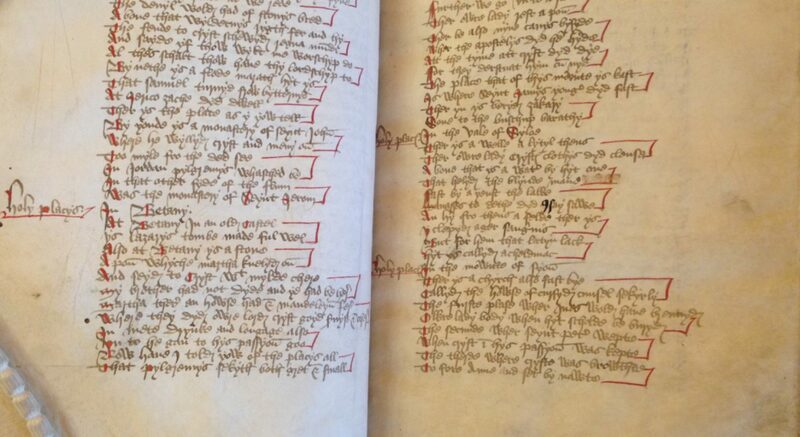 This manuscript illustrates well the potential difficulties faced in reading a manuscript, particularly when that manuscript is not written in a book hand, but one not meant for display, or with any particular concern for anyone else being able to read it. Luther, in this respect as much as any other, was no humanist! Moreover, the quality of the script varies considerably, as does the extent of its survival. The above page is clear, but as can be seen below, it does not remain so, and throughout the manuscript the legibility and correction of the script varies considerably. In order to work with it, I created a reference alphabet of Luther’s script from the clearest pages, and then applied this to the remaining pages. A sample of Luther’s ligatures. With familiarity, it became easier to transcribe. After I had begun working on it I discovered that there had been an edition of it by Ernst Thiele, which was later included in the Weimar edition of Luther’s works. On comparing the edition with my own transcription, I was pleased to find that they were mostly in agreement – and, perhaps, even more pleased to find that someone else had had more luck with some of the words I found nonsensical. Apart from Luther’s handwriting, the transcription was made more difficult by the fact that either the words are highly abbreviated, or the proverb itself truncated or reduced to a prompt. Even when transcribed, lines can make little sense, for example, ‘ohren melcker’, or ‘ear-milker’ (which probably means ‘flatterer’). Further, Luther switches between German and Latin across the manuscript, often with the Latin reduced to a series of abbreviations. It is interesting to find that Luther tends to write explanations of the German proverbs in Latin, which may mean that Luther read and wrote more instinctively in Latin, or that he made ready connections with existing Latin proverbs. The quire mark ‘A’ can just be seen to the left of the Bodleian stamp. Bodleian Libraries, MS Add. A. 92, f.1r. Photograph: Alexander Peplow, courtesy Bodleian Libraries. around 500 lines of text. These folios are in three quires, the first two of which are faintly marked with an ‘A’ and a ‘C’ on their first pages. (See detail, from f. 1, right). The third has no letter marking, while it would appear from the marking of the quires that one is missing, no doubt marked ‘B’, which originally lay between ‘A’ and ‘C’, and where, unfortunately, there may have been a large number of other proverbs which have now been lost, up to approximately a quarter of the original total, though this can only ever remain speculation. The considerable change in the colour and nature of the ink used from the end of quire ‘A’ and the beginning of quire ‘C’ (ff 8v-9r, below) is further evidence that there has been a loss of material, and that, at least, the ‘C’ quire was not begun immediately upon the filling of the ‘A’ quire. The manuscript is written in a variety of inks, almost all of which are of an uncommon red-brown colour, suggesting that Luther write it over a period of time. This fits with it being a notebook of ideas and things-overheard. The ‘A’ quire has the most structure, being written in a fairly consistent ink and containing considerable revisions and corrections added in a different ink at a different time. There is no evidence of annotations or corrections in the later sections of the work, which suggests that, though Luther may have begun the work with some thought of publication, he later abandoned the project. Bodleian Libraries, MS Add. A. 92, f. 8v. Photograph: Alexander Peplow, courtesy Bodleian Libraries. Bodleian Libraries, MS Add. A. 92, f. 9r. Photograph: Alexander Peplow, courtesy Bodleian Libraries. Bodleian Libraries, MS Add. A. 92, f. 11v. Photograph: Alexander Peplow, courtesy Bodleian Libraries. likely an eagle, gives some indication of its dating. First, all the quires of the manuscript contain the same watermark, and so the whole booklet is made up of pages of the same manufacture. Secondly, this watermark is identical with a watermark also found on the manuscript, also in this note-paper format, of Luther’s tract Wider Hans Worst, which was written and published in 1541. This can, however, this can give no definite bearing on when the proverb collection may have been written, especially given that it is likely that the manuscript was completed over a period of time. The manuscript has been bound at least once before its present binding, and was bound into its current form prior to its acquisition by the Bodleian in 1865, as it still retains the bookseller’s markings. The pages of the manuscript have three holes in them, indicating a previous thread binding, from which fragments of a blue thread remain. This binding was likely not, however, its original binding, for if it were bound in such a way, the position of the thread holes would have made it impossible to read or write in the gutter margins on some pages where there is writing present. Further, the noticeably dirtier first page suggests that the manuscript spent a period of time without a cover, which could have been its original state. In sum, this was certainly a usefully demanding manuscript to start a project on, with interesting elements in its script, text, dating, and binding in addition to its initial attraction in its author. It was also a rare opportunity to look at Luther in as unmediated a way as possible. The proverbs themselves deserve more attention than they have been given, but the manuscript is a fascinatingly tangible piece of Martin Luther and his approach to writing and thinking. The manuscript will be on display in the Weston Library 30th October-3rd November as part of the Bodleian’s marking of the 500th anniversary of the Reformation. Written with thanks to Professor Henrike Lähnemann, who supervised the project. Photographs by the author, with permission of the Bodleian Libraries. A description of the contents and context of the manuscript can be found on The Conveyor, the blog of the Bodleian’s Special Collections.